We’re always working to improve GQueues so you can have the best experience. This spring we launched several updates to the web version and Android app to help you navigate tasks more quickly and easily. Here they are! 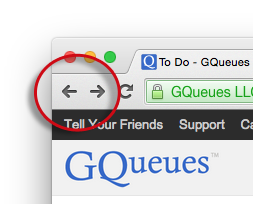 Back and Forward - You can now navigate queues using the back and forward browser buttons. For example, if you were in your Projects queue, then went to your To Do queue, you could just click the browser's Back button to go back to Projects. There are keyboard shortcuts for this as well. Custom Web Addresses - Each queue now has a unique URL for making links and bookmarks. It's another way you can keep track of important pages, save them for later and navigate seamlessly on GQueues. (The URLs are specific to your account and require you to be signed in, so others will NOT be able to see your data just because they have a link). Open Queues in New Tab / Window - You can now easily open queues in different windows or tabs by holding down the shift-key and clicking the queue name. This allows you to see work side by side and focus on what's important. Saved Searches for Android - You can now view your saved searches in the Android mobile app. Users have wanted this functionality for a long time, so we’re happy it's now available. Design Tweaks - While most of the updates were functional, we also made a few design tweaks. A new left-side drawer lets you jump to different types of queues, and Active / Archived buttons are now in the top menu to give more space for your tasks. Bug Extermination - We squashed a number of outstanding bugs to make the app more robust and an optimized experience for you. Thanks to our great beta testers for helping us verify all the improvements during the last several weeks. Visit GQueues on the web or your Android device to enjoy these new features!